A large and worrisome amount of highly degraded asbestos material is dispersed throughout a popular recreational area. The Peter Murrell Reserve at Howden is reportedly ridden with broken pieces of the deadly substance which was dumped there by unprincipled renovators. Amidst the scattered refuse is blue asbestos, said to be the most fatal to human beings.Even though the problem was reported to authorities two months ago, and despite an apparent clean up, hundreds of asbestos fragments remain on the ground of the park. 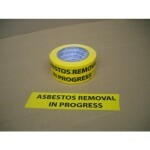 Asbestos was a popular building material used in the post-war era, prior to being progressively banned from the 1980s. Inhalation — regardless of how minute, can cause fatal mesothelioma years or even decades after exposure. Builder Scott Cordwell was horrified to find asbestos throughout the reserve. There is a distinct lack of warning signs or barriers preventing members from the public from being exposed to the deadly material. Parks and Wildlife Service general manager Peter Mooney recalls hearing reports of asbestos in the reserve from Workplace Standards Tasmania and Kingborough Council in October. “A sample of the asbestos was collected. This was tested and confirmed to be asbestos,” he said. “Given that dumping of material such as this in bushland close to urban areas was a very common occurrence for many years, there may be other small deposits at the reserve. The revelation comes days after the Asbestos Free Tasmania Foundation launched the Tasmanian Parliamentary Interest Group on Asbestos. AFTF spokeswoman Susan Wallace is concerned that asbestos might be present in the reserve and believes an investigation and clean-up is urgently needed.